About 60 people attended MADSA's February general meeting, which focussed on vision proposals for our work in 2019. At MADSA’s January general meeting we passed four “vision” proposals that members had submitted to guide our work during the coming year. A fifth proposal was tabled till the February meeting, for lack of time. All five can be read (as amended) here, and others can be submitted for consideration, two weeks in advance of any general meeting, at info@madsa.ga. Two proposals dealt with electoral work: One calls for 1) Bernie Sanders to run for president in 2020 through the Democratic Party’s primary; 2) rank and file members to run in down-ballot elections in the Democratic Party’s primary; 3) a MADSA committee to develop a Bernie campaign plan and a general electoral plan to submit to our March general meeting; and 4) the National Political Committee to provisionally endorse Sanders should he announce his candidacy, with the final decision to come from the national convention in August. The other electoral proposal establishes a procedure for MADSA to make decisions about candidate endorsements. A third proposal committed the chapter to prioritize housing justice work by supporting the Housing Justice League, and the fourth proposal addressed how MADSA could, and should, become an organization that is led by people of color. The fifth proposal, to be discussed and voted on in February, outlines ways MADSA can make it easier for people with limited income or time to participate in our organization. The session on proposals followed several working group reports and announcements. Member Marshall Rancifer reported on efforts to help homeless Atlantans survive the winter. Jeff Corkill reported on the upcoming action to oppose a KKK presence at Stone Mountain Feb. 2, and Alexander Hernandez urged members to join our allies and our Immigrant Justice working group at a lobby day at the state capitol Feb. 20. 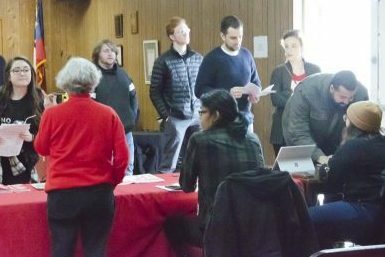 Lisa Ashway reported on our canvassing and phone banking in the 6th Congressional district to urge Representative Lucy McBath to support Medicare for All, which will take place again Feb. 9. Marshall Rancifer reports on efforts to help homeless Atlantans.